Palm gets its second chance at a rise-from-the-ashes rebirth today–this time under Hewlett-Packard’s aegis. At an invitation-only event in San Francisco (wisely scheduled after the CES tablet deluge of 2011), HP will uncrate its first webOS hardware since its acquistion of Palm. Among the products expected to be unveiled–the long-rumored “PalmPad” and perhaps a new smartphone or two. Certainly that’s what HP Personal Systems Group Executive VP Todd Bradley’s been hinting at recently. Join us here at 10:00 am PT and find out if he’s right. 9:51 am: HP’s pulled together quite an…Apple-esque event for us today. Herbst Pavilion is adorned with massive HP banners and inside, the media and analysts gathered here are mingling beneath atmospheric blue lights. Noticeably absent: any–and I mean any–sign of the Palm brand. 9:59 am: A quick spoiler ahead of the event, which should start any moment now: The tablet HP will be showing off today is called the HP TouchPad. 10:02 am: One decidedly un-Apple-esque element of today’s presentation: The music selection. No Beatles, Dylan or Clapton. Just borderline unbearable club music/electronica. 10:05 am: Ah. The refrain in the aforementioned unbearable soundtrack: “One touch is never enough…been waiting such a long time.” Wonder if HP commissioned it. If they did, I hope they didn’t pay too much. 10:10 am: Looks like we’ve got a packed room. The Palm developer community in its entirety (snicker)? 10:16 am: And here’s Bradley to kick things off. 10:16 am: Bradley: I’d like you think back to that moment in time when you experienced something for the first time. I vividly recall the first time I drove a whisper-quiet electronic car…my first video conference. We should all witness as many of these firsts as we can in our lifetime. At HP, we’re about creating these firsts. 10:18 am: Bradley talks up connected experiences and claims that HP will soon begin delivering robust ones to folks around the world. 10:19 am: Now a quick historical overview of HP tech: The first pocket calculator, the first ink jet printer. 10:19 am: Talking about HP’s scale now and the size of the market for connected devices. Bradley says the connected devices market is $160 billion and growing. 10:21 am: So how do we bring HP’s scale to webOS development efforts, Bradley asks, before recounting how the company has brought its engineering heft and resources to bear on the OS. “We keep the tools in the garage unlocked,” he says. 10:23 am: We’ve seen a proliferation of devices, says Bradley, and an explosion in content and services. But no one before today has come forward with a solution that provides a continuous experience across devices…a solution that gives you access to your digital universe regardless of which device you use. That’s our intention with webOS devices. And with that, Bradley welcomes Jon Rubinstein to the stage. He continues, citing various compliments webOS has received in the media. 10:29 am: Rubinstein remarks that the smartphone industry seems to be headed toward larger and larger devices. HP has evidently chosen to go in the opposite direction. “We’ve been thinking small,” says Rubinstein. And with that he announces the HP Veer, a tiny credit-card-size webOS phone. Veer will be available in early Spring. 10:36 am: “This is a phone that’s built for serious speed and serious fun,” says Rubinstein, adding that the device will be available this summer. Both new webOS phones are Touchstone compatible. They’re also context aware and will display information based on where they’re docked (not entirely sure what that means yet). 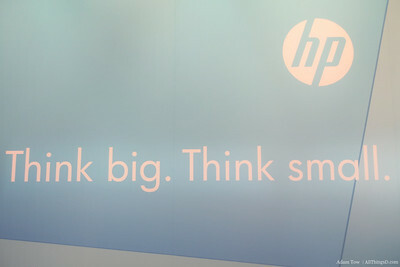 10:37 am: Moving on to the Think Big portion of today’s event: The HP TouchPad, the first device in the TouchPad family. 10:38 am: It weighs a little more than a pound and a half, just 13.7 mm thick. Uses Qualcomm’s newest dual-core 1.2GZ Snapdragon processor. “The TouchPad is screaming fast,” says Rubinstein. 10:40 am: So how will the TouchPad distinguish itself in the increasingly crowded tablet market? WebOS is the key here, says Rubinstein, noting the operating system’s powerful multitasking features, “an unmatched email experience” and Synergy. If you own a webOS phone, all you have to do is enter your webOS user ID into the TouchPad and it will sync all your contacts, calendars, email, etc. 10:42 am: TouchPad comes bundled with Quickoffice for editing Microsoft docs. It suppors VPN, video calling, wireless printing and Adobe Flash. 10:43 am: Content-wise, the device supports the standard fare–movies, TV, books, magazine subscriptions, etc. 10:44 am: HP will roll the TouchPad out with some slick accessories: A case that doubles as a stand and a keyboard. 10:45 am: Rubinstein calls product manager Sachin Kansal to the stage to show off some of these devices’ features in depth. 10:46 am: First up, webOS exhibition mode, which displays photos or calendar while charging on a Touchstone. Kansal demonstrates a reply to a text message showing up simultaneously on the TouchPad and Pre3 via Synergy. 10:48 am: Touting webOS’s multitasking features now. Swiping across a range of open applications that have been left open for use. 10:50 am: New feature: Card stacks–the ability to stack related windows on top of one another. A shopping list in notepad and a browser window open to one of the stores at which you plan to shop, for example. 10:52 am: That said, webOS’s mail app does seem to be robust and elegant as well, particularly with Synergy working in the background to sync everything across multiple devices. 10:52 am: Nice multi-select feature in mail that allows for easy inbox purging. 10:53 am: Really talking up multitasking on the TouchPad. “In webOS, multitasking was not an afterthought, it was a key feature we developed from the very beginning,” says Kansal, in a pointed jab at Apple. 10:56 am: Now a quick Flash demo. “Kung Fu Panda” preview. Looks fine and, remarkably, plays seamlessly without crashing the device. 10:57 am: Now on to in-app notifications. Unobtrusive and easily navigated and managed. Tap a notification and it launches the app you need to address it. Tap it again to delete the notification from the queue. 10:59 am: TouchPad keyboard includes numbers and letters on the same screen. Handy. Also something the iPad doesn’t offer. 11:00 am: Deep social networking integration. Twitter, Facebook, LinkedIn, etc., integrated into not just your address book, but photos as well. Connected photo albums allow users to view Facebook photo albums and the like within webOS’s photo app. Quick demo of wireless printing from a connected photo album. “It just works,” says Kansal in an unintentional nod to an unmentioned rival. 11:03 am: Kansal says webOS has had a lot of success in building HTML 5 applications, but also a lot of success with Open GL games. He demos a flight simulator/combat game that looks decent enough. Not Unreal-engine quality, but pretty good. 11:05 am: Moving on now to magazine subscriptions. A quick scroll through Sports Illustrated. “While on the one hand we are partnering with leading publishers like Time Inc. for magazines, we also want webOS to be a great platform for books, which is why we’re partnering with Amazon to bring Kindle to the TouchPad. 11:06 am: Standard Kindle reading experience, quick access to all Kindle controls and syncing with your Kindle libraries. And there’s Rubinstein in a video call. Transition seems absolutely seamless. 11:09 am: Impressive demo so far. Now this is interesting. Kansal pulls up a restaurant Web site on the TouchPad. He then takes his Pre 3 and places it on the TouchPad screen and the phone automatically launches a browser and directs it to the same restaurant Web site. 11:11 am: Rubinstein returns to the stage to talk about TouchPad partners. Among them: Dreamworks. Rolling video of Dreamworks CEO Jeffrey Katzenberg recounting his experiences with the TouchPad. “HP has hit it out of the park,” he says before rehashing many of the features we’ve seen on display this morning. 11:14 am: Uh oh. The Wi-Fi version of the TouchPad won’t be available until this summer, with a 3G version to follow. Not the greatest shipping schedule, particularly if Apple brings the iPad 2 to market this spring as expected. 11:15 am: Moving on to the next partner: Qualcomm CEO Paul Jacobs. “When you have the scale and size of a company like HP, you can work with anyone. And HP chose to work with us,” he says before rambling on about how fantastic Qualcomm and its wireless chips are. 11:18 am: Allow me to summarize Jacobs’s spiel in three words: Snapdragon is awesome. 11:21 am: Quick update from Jacobs: TouchPad is also awesome–even more awesome because it runs Qualcomm’s Snapdragon dual-core solution. So what’s the device’s battery life like? 11:23 am: Ah. Jacobs just said Snapdragon enables “all day battery life.” Is that a euphemism for eight hours or six? 11:24 am: Rubinstein returns to the stage, talks up Beats by Dr. Dre, the audio system used in the TouchPad, and then welcomes Jimmy Iovine to the stage. 11:29 am: Today, the PC isn’t just a home stereo, but a tool for musicians–for recording and for performing, Iovine says. We should be demanding a better audio experience. 11:32 am: Steven McArthur, SVP of applications and services, takes the stage to talk about developers and application development. 11:34 am: Talking up the Facebook app for webOS now. Evidently, Facebook users rank the Facebook app for webOS as the best one on the market. 11:36 am: And now, Selfaware Games, purveyor of fine webOS card games enhanced with in-app payments. I’ve never played them, but Selfaware’s games look pretty rudimentary from the images on stage. 11:38 am: McArthur claims that the TouchPad will soon offer the best tablet gaming experience on the market. Hard to believe right now, given the webOS games I’ve seen to date, but you never know. 11:41 am: Rolling another video now. An overview of Time Inc. pubs, presumably with a cameo by a Time exec to follow. 11:42 am: And here’s a very excited Randall Rothenberg, chief digital officer of Time Inc.
11:44 am: Standard “Time and HP are both awesome” preamble. Assume the “unlike Apple” is implied. 11:47 am: Moving on to Time magazine. Here the photo rendering stands out a bit more. Rothenberg’s right. The pictures look great. When the TouchPad hits the market place, people will be able to download apps for Time, Fortune, People and Sports Illustrated. 11:51 am: Rothenberg says one in five adults will own a tablet by 2015. 11:57 am: 11:57 am: This is obviously a huge shift for HP, which has been a Windows shop for a looong time now. In Palm’s webOS, HP has an elegant OS that it controls, something the company–a longtime Windows shop–has never had before. And with it, it can begin untethering itself from Microsoft and differentiate its brand in a market in which most devices not sold by Apple are all running some variant of Windows. Remember, webOS is scalable. And while Palm lacked the means to scale it, HP does not. It’s one of the biggest tech companies in the world, and once it brings its engineering acumen and marketing heft to bear on the OS, my guess is we’ll see it evolve into a much larger platform that extends beyond smartphones to tablets, ultraportables and other connected devices. And HP, for the first time in its history, will be firmly in control of both its hardware and software. 12:00 pm: Rubinstein joins Bradley to wrap things up. Thanks the company, the webOS team and, oddly, some celebs in the audience–MC Hammer and Serena Williams. Then another restatement of HP’s commitment to webOS and its plans to create this massive global ecosystem we’ve been hearing about all morning. 12:03 pm: One last video reel showing off the hardware announced today–Veer, Pre 3 and TouchPad–and the event concludes.